After waiting nearly 4 years for SpyParty, I’ve finally got my hands on it with the public beta. I’d hyped it up so much for myself, I wondered if it could ever be as fun and exciting as I wanted it to be, a game based solely on playing mind games with another player seemed like something I needed to try for myself. After spending several hours with it in the last week, I can say it was definitely worth the wait. SpyParty is a two-player game that relies very little on skill with video games, and instead asks you to get inside the mind of another human being. One of the two players takes the position of the Spy. The Spy is a guest at a party, and is tasked with doing a certain number of objectives in a certain amount of time. The other player is the Sniper, who is tasked with pinpointing the Spy, and taking him out before the goals can be completed. 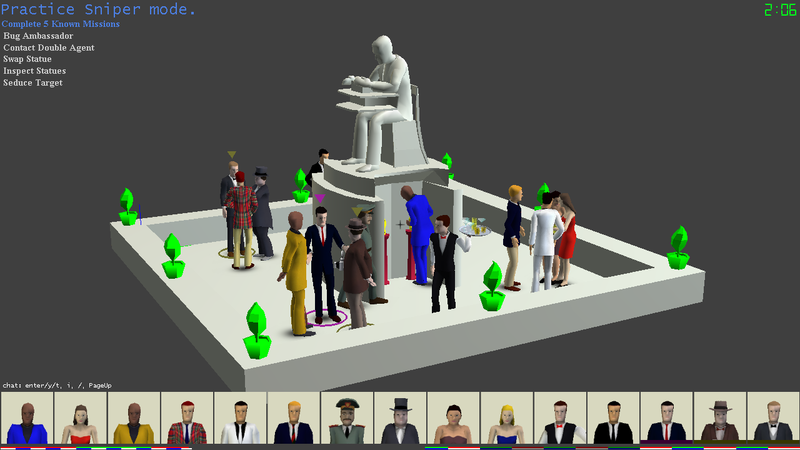 At the party, the Spy blends in with several other guests controlled by AI who are all performing similar actions. They all walk around and chat with other partygoers, they’ll take a book from a shelf, investigate art, etc. The Spy’s goal is to never give away that they are human-controlled while making their way in and around conversations with the NPCs in order to win the game. The Sniper is always waiting outside the party, watching everyone in the room, trying to suss out which of the guests couldn’t be an AI, and then taking their one shot. SpyParty becomes a tense game about reading body movement and positioning between two people. As soon as the Spy does something a little too suspicious, they’ll have a bullet in their head. The tension builds between both participants, however. While most of the excitement (for me) comes from acting the part of an NPC as the Spy, the Sniper has an overwhelming part to play as well. The Sniper is tasked with intricately watching a dozen or so characters and picking out which are suspicious and which aren’t. 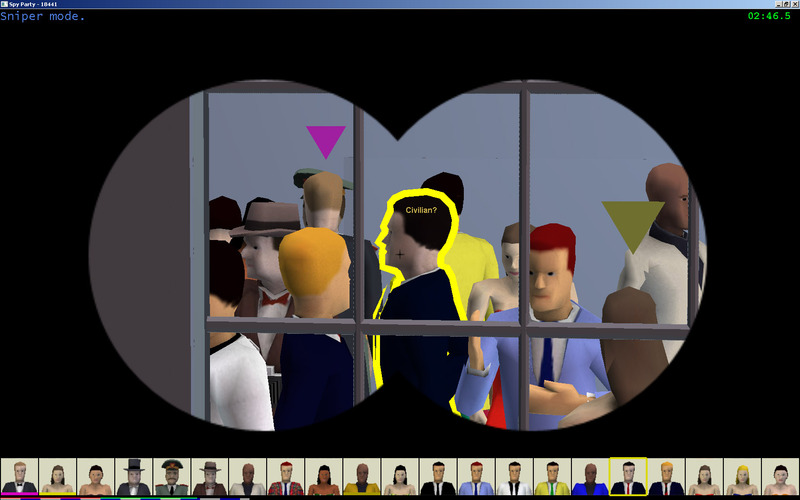 The Sniper can highlight suspects and lowlight what they believe to be NPCs in order to narrow down the playing field piece by piece. Once you feel like you’ve got the right target, it’s a terrifying feeling to pull the trigger. It’s almost impossible to be 100% certain if you’re going to shoot the Spy or an innocent civilian, but the ride up to that point is exhilarating. Once you realize you’ve killed the Spy, the sense of satisfaction is nearly unmatched. SpyParty is very much a game about reading people and figuring out what they’re next move will be. It’s about playing the part of an actor, except when you flub a line you’ll end up dead. Subtle trickery is necessary in order to win a round. No real person would stand by a wall and drink for 45 seconds, would they? Since the Sniper’s laser sight is pointed way over there, does that mean they aren’t watching me, or is that just what they want me to think? It’s a game of tension and deception, with the Spy and Sniper constantly attempting to outsmart each other. Assassin’s Creed Brotherhood incorporated similar ideas into its multiplayer, but with SpyParty’s 1v1, it’s a lot more personal. It just as great of a feeling to elude the Sniper as it is to take down the Spy, and with every win or loss I found it hard not to say “just one more round” until the early hours of the morning. A full redesign of the game’s art is planned eventually, but the game has been in development for so long don’t expect it anytime soon. If you want to get in on the ground floor, and have access to future versions of the game as it is developed, SpyParty is now in public beta, which can be entered for $15 on the game’s website here. Tags: Chris Hecker, PC, SpyParty, Turing. Bookmark the permalink.